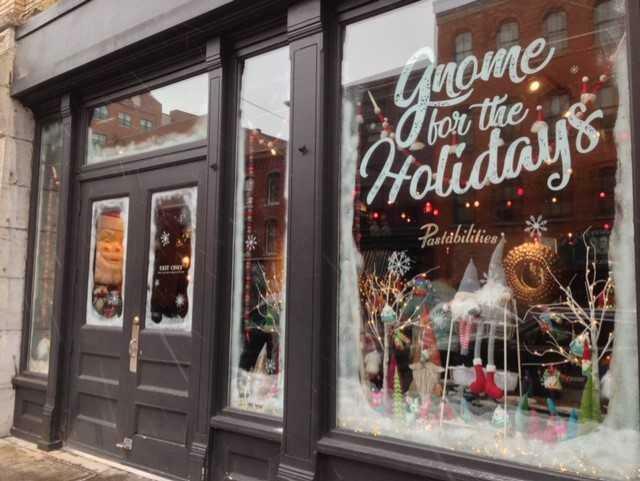 Downtown in Armory Square has many options for Small Business Saturday. Merike Treier is the Executive Director of The Downtown Committee. She says eighteen retail businesses have opened in Syracuse within the past year. "We've got such a unique selection of retailers, boutiques, jewelery stores, clothing stores that sell men's and women's clothing," said Treier. "Unique gifts with some history attached, the OHA has their gift shop. So downtown is a very convienient location to get a lot of your shopping down, but find a variety of gifts that will suit everyone on your list." The SBA says that roughly 45 of every 100 dollars spent at small businesses recirculates in the local economy, compared to only 14 dollars when consumers buy from the big box stores. Small business owner Monica Villegas opened Floridella Boutique around the corner from the Landmark Theater on Jefferson Street two months ago. "It's very homey, cozy, personable," said Villegas. "We cater to you individually. We want you to look your best." Villegas describes the jewelry and accessories she offers at her store as “different flavors” that range from boho to glam to vintage. "In our clothing, you'll also see the same thing," said Villegas. "We're going to cater to the trendy, but also the funky and different. The bling-bling. All the good stuff that the ladies are appealing to." Villegas also finds herself admiring other locally owned stores in Downtown Syracuse such as those in nearby Armory Square. The SBA is encouraging consumers to support local small businesses and restaurants with the ‘Shop Small’ initiative on Saturday.